I was thinking this morning ..... my wife returned from shopping recently and told me that while she was in the process of purchasing the regular rice in the market, the very nice lady intervened and said 'madam you want to buy this polished rice, why don't you buy Abakaliki rice? It is very good o.' While she spoke, there were flashes in my head tending towards worry about the quantity of 'polish' I have eaten over the years. Before you tell me to calm down and not be scared, understand where I am coming from. Whilst I sat quietly listening to her, the mention of 'polished rice' reminded me of a gist we loved while in secondary school about a young man waiting to go across a busy road. At the point of crossing, he observed an elderly woman also waiting to cross over. He stopped the traffic and took the woman by the hand to the other side of the road. The woman in response looked at the young man and said, 'Young man, thank you. You have a very polished character.' Without hesitation, the young man responded, 'Yes, I use Kiwi.' Hmm!!! In those days, Kiwi polish was the most popular brand of shoe polish for students and as far as the young man was concerned, you cannot talk about polish and not mention Kiwi. So pardon me when I thought of 'polish' as the cream (noun) you apply in shining your shoes, rather than the act (verb) of making smooth and glossy, especially by rubbing or friction. Phew! With that understanding I relaxed and listened to the rest of my wife's gist. But it got me thinking about the benefits of polishing rice. 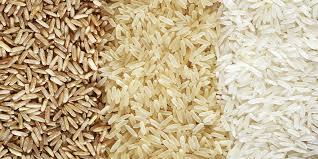 Polished rice is rice that has been milled and had the husks, bran and germ removed. You polish something to make it better, but it seems that of rice, apart from making it look good, has caused more harm than good. My prayer is that God will give us the grace to polish our daughters and eat unpolished rice this Sunday. Weymey, you didn't tell us the type of rice your wife eventually settled for. Be it as it may, polishing in its content and intent is not bad at all. It tends to make whatever is being polished better. Rice, like you rightly said, polishing has made it less nutritious. Our local rice is sweeter, taste better, more nutritious but for the stones and the bran. God bless us all and especially you Weyimi for sharing these thoughts with us always.